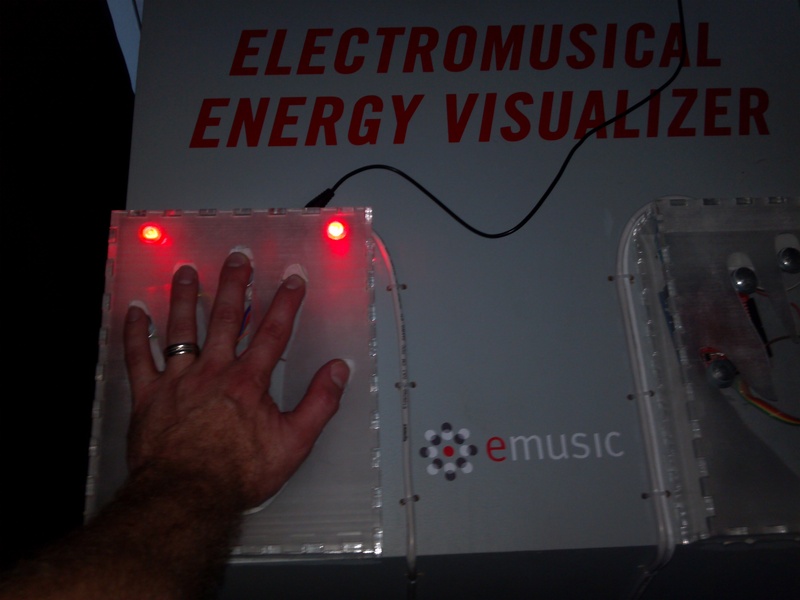 We’re getting closer to doing actual real scientific experiments at concerts. I’m also excited to tell you what I saw because it pushes our experiments forward too. 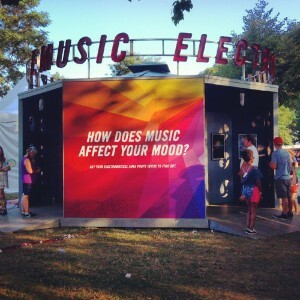 I say this because during my time at Pitchfork Music Festival I had the pleasure of going into the eMusic Eletromusical Energy Visualizer to see how certain types of music affected my mood and my aura. The booth is part of eMusic’s exploration about the connection between our favorite bands and our auras. When I frist saw the EEV I was intrigued. I took a look around and then stepped in to see what it was all about. I slipped on the headphones and put my hands on the sensors. As I listened to short snippets of Beach House, A$AP Rocky, Ice Age and Lower Dens tunes, the machine flashed and buzzed. 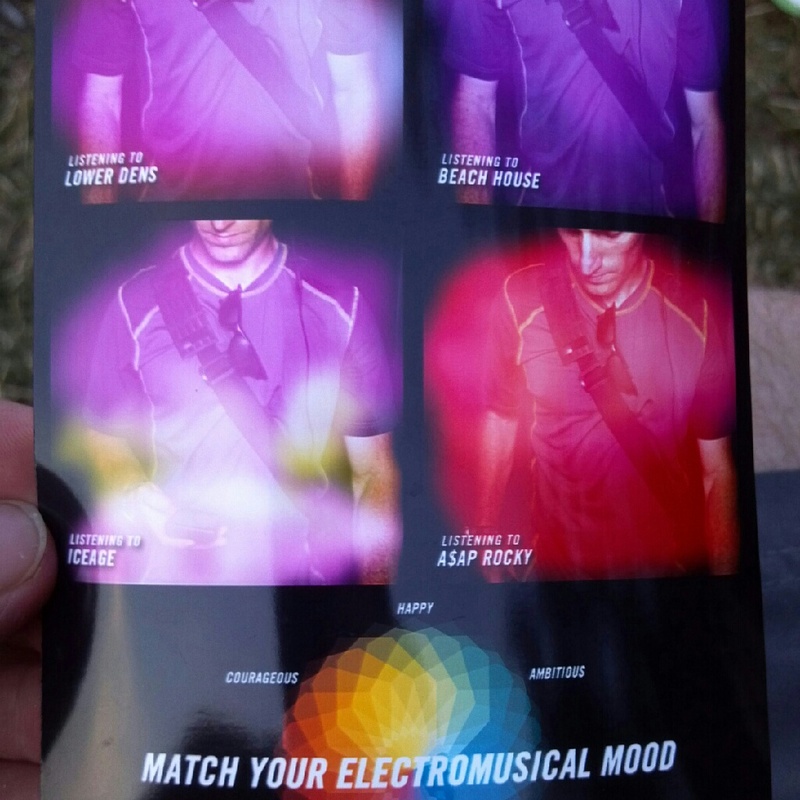 Then a few minutes later I step out of the dark booth and was handed a sheet that showed me how my auras were impacted by the different tunes. Looking at the sheet I thought how clearly part of this is psuedoscience and what I just took part in was largely for my own personal entertainment. But as I walked away from the booth and took in the rest of the festival, I thought about a few things. I thought about how something like this could be a great opportunity to merge entertainment and emotional education and create an experience that would be extremely valuable for concert fans. For starters, as we already know, live music impacts us on a deep level. There’s all types of stories unfolding. Going to concerts is a spiritual, physiological and psychological event whether you realize it or not. And that’s what the EMV gets us to consider. Anytime we have the chance to stop and think about how something that happened at a concert is affecting our mood we’re always better after the experience. And that’s what the EMV does, even if it isn’t completely accurate. When I stood in the booth I wanted something more. I wanted to be able to pipe in the live music that was flowing all around me at the festival. I wanted to be able to do a true sensory experiment of what I was feeling at that very moment or during a heightened moment during my favorite song. I know I would pay for something like if it was able to capture and give a visual representation of what I was feeling on the inside. With our first baby coming this fall, one of the most amazing things during the last eight months has been to see what the baby looks like as it’s growing inside my wife via the ultrasound pictures. So why not strive to create a similar priceless picture of what concert fans feel on the inside during a concert that just rocked their world? All that said, I didn’t only want to know how a recorded snippet of music was moving me emotionally, I wanted to be able to know how the music surging from the stages was impacting my mood. I had seen Beach House before and had an amazing experience tweeting human emotion and I wish I could have piped in their set while in the EMV booth. So maybe next year, eMusic or someone else will figure out how to pull this off. Maybe a mobile app could do it? Maybe next year, we as fans will have evolved as a species to a point where we desire to truly know and have scientific data that shows us how our favorite live music experiences are influencing our moods and changing our lives. I don’t know about you, but I would love to see how my live music mood and aura compares with other fans and my favorite artists. Then if we’re able to to that, we should be able to understand how our auras and moods impact each others during the show. That would be the ultimate communal concert experience! How do women experience live music?